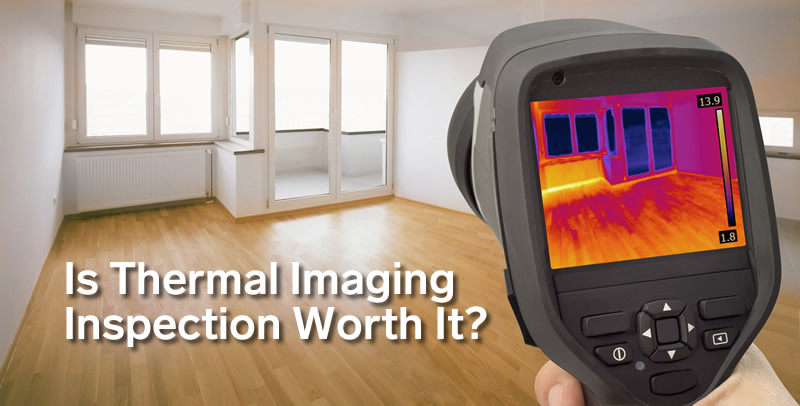 Is Thermal Imaging Inspection Worth it? Is Thermal Imaging worth it? This is one of the questions that we receive most often. Although sometimes flashy new technology is often a want instead of a need, in the Las Vegas home inspections industry, one of the more advanced pieces of technology tools inspectors have is an infrared camera. What is Thermal Imaging Inspection? Thermal imaging is a technology based method which improves the visibility of objects in a dark environment. This is done by detecting the objects’ infrared radiation (heat level) and creating a color highlighted image based on that information. Here’s a summary of how thermal imaging works: The infrared energy emitted by an object is known as its heat signature. All objects emit infrared energy (heat) as a function of their temperature. Generally, the hotter an object is, the more radiation it emits. Thermal imagers (AKA thermal cameras) are capable of detecting tiny differences in temperature. A thermal imager is essentially a heat sensor device which collects the infrared radiation from objects on the property and creates electronic, color, image based information about the temperature differences. Since objects are rarely the same temperature as other objects around them, a thermal camera can detect them and these temperature differences will appear distinctly in a thermal image. 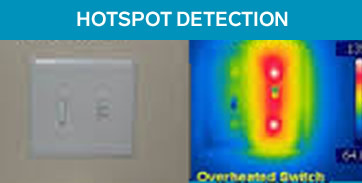 How is Thermal Imaging Used in Residential & Commercial Property Inspections? Thermal Imagers allow home inspection professional to look beyond physical elements that are not visible to the naked eye. In many cases, homes or commercial properties that appear perfect can have significant issues that can be missed without thermal image inspection. Water Leakage: Water leakage is a significant concern for most all our clients. In fact, over the last 30 years, we have learned that water is the single biggest enemy of homes. A expert home inspector knows how to tailor his Thermal Imaging Inspections to look for concealed water problems. During our Thermal Imaging Inspections, our Home Inspectors will use infrared cameras to look for hidden moisture in the most vulnerable areas, with specific focus on basements, areas around and below doors and windows, and ceilings below roofs and bathrooms. The most important aspect of a thermal image inspection report is the inspector’s interpretation of the data. As there are some, limitations of thermal imaging, the quality of thermal imaging report depends exclusively on the qualifications, training and experience of the inspector. Depending on the established baseline thermal readings, and the location of the images, the results can clearly alert the client to a critical repair that will be needed. It is also important to note that thermal imaging equipment is very expensive and not every inspector offers this Specialty Inspection service. Nevertheless, those who use thermal imaging devices for both home and commercial property inspections will testify that it’s become one of the more indispensable devices in their tool kit. Is my Home Inspector Qualified to do Thermal Imaging? Your home inspector states they need just a few hours to do your inspection. This is false. A professional residential or commercial property inspection requires at least 4-6 hours to do be completed properly. Your home inspector says it with thermal imaging it will be easy to identify water leaks and moisture problems. This is also false. 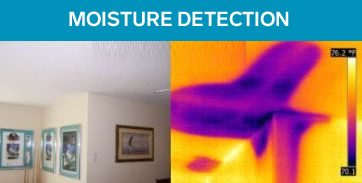 Even with the use of technology aids like a thermal imager, the most experienced and qualified inspectors know that finding moisture problems is often difficult. This investigation takes a lot of time, and requires very thorough knowledge of the regional area and local building techniques. In short, it takes years of experience and expertise to make proper use of thermal images. Your home inspector wants to do the infrared inspection during daylight hours. This is also a sign that the home inspector is not fully qualified. An expertly trained home inspector will want to see the home’s exterior prior to sunrise or after sunset to look for clearly identifiable temperature differences. Your home inspector states that they only need to do an interior or exterior scan to get all the important details needed from Thermal Imaging Inspection. False again. Any home qualified property inspector will scan both the inside and outside of a property to compare the differences between the surfaces and better understand the property’s condition. Any or all of these statements should make your re-evaluate whether your home inspector is qualified to perform an infrared home inspection. Don’t waster your money for a junk report. Always you a certified professional Thermal Imaging Inspection expert. Do you have questions about Thermal Imaging Inspection in Las Vegas? If so please be sure to Contact Us. Vesta Inspection owner and president, Dean McGlasson started Vesta Inspections in 2004 with the goal of becoming the premier and preferred source for home inspection services in the Las Vegas valley. Since then, Dean has inspected thousands of residential and commercial structures throughout Las Vegas, North Las Vegas, Henderson, Lake Las Vegas, Boulder City and Mt. Charleston. Dean is certified by the State of Nevada and has hands-on construction experience in structural framing/build-out and remodeling. Dean held the position of project manager performing Property Condition Assessments (PCA) on large retail shopping centers, multi-family apartments, commercial office buildings, industrial complexes and facilities. Dean has extensive experience, training and study in all aspects of building construction and inspection, for both residential and commercial structures. Dean is the current President of the Southern Nevada Association of Professional Property Inspectors (SNAPPI). In this role, Dean is responsible for professional training and representation of Southern Nevada’s local property inspectors. Vesta Inspections provides professional home inspections in the greater Las Vegas valley and surrounding areas. 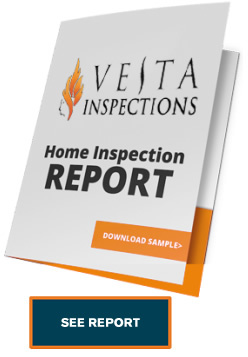 Vesta provides you with a thorough and detailed visual assessment of the property and home to uncover any defects or deficiencies so you can make an informed decision. We are looking out for YOUR best interests and we’ll be there for you every step of the way, even after the inspection. My experience was phenomenal. The inspector was punctual, skilled, and thorough. If you've been using other inspectors then fire them. Here is someone you can count on to tell you need to know. What Is Covered Under This Inspection? What Type of Inspection Report is Supplied and When Do I Receive It? What Should I Be Looking for When Choosing My Home Inspector? Do you have questions about your home inspection or the subsequent report? We are always available to discuss them with you.